Young hearing and Deaf actors will perform on stage together in a signed and voice presentation of Pinocchio by Neverbird Project, April 20-May 7, 2017 at Chicago Children's Theatre, The Station. Young hearing and deaf actors will perform on stage together in a signed and voice presentation Pinocchio, only the second production in the new Chicago Children's Theatre, The Station. Presented in association with Chicago's Neverbird Project, this all-new production of Pinocchio promises to spring to life as an inclusive and inventive take on the classic fairy tale. Performances are April 20-May 7, 2017 in Chicago Children's Theatre's new 149-seat Pritzker Family Studio Theatre at The Station, 100 S. Racine Avenue, in Chicago's West Loop community. You think you know the story of Pinocchio, but you've never experienced it like this. Who doesn't love the familiar tale of a boy marionette, a toy maker and a talking cricket? Pinocchio's quest to become a real boy is a love letter to our youth, and the life that's ahead of us - just so long as we put one foot in front of the other. With Neverbird's unique integration of Deaf and hearing actors, children will see this beloved fairy tale in a whole new way, and with a fresh perspective on the story's central question - how do you allow joy and grief to live in your heart simultaneously? "This production is an example of ground floor inclusion and accessibility," said Levi Holloway, co-founder of Neverbird Project, which first presented Pinocchio in 2016 at Bell Elementary School, a CPS school with a focus on integrating Deaf and hearing students. "We are teaching all of our hearing actors ASL to tell the story, to enrich relationships between our Deaf and hearing artists onstage and off. We at Neverbird believe that total accessibility and inclusion is a necessity in American theater." To that end, ASL is a native part of the world of the play, and every actor will sign. Through light, sound, spectacle and ASL, this Pinocchio will speak to every age and ability for an unforgettable family theater experience about love, loss, family and hard choices that aren't so hard in the moment. The principal cast features (bottom, from left) Julissa Contreras, who is Deaf, as Pinocchio, with Haley Bolithon as Blu, Sarah Cartwright as Cricket, Chris Chmelik as Geppetto, Skyler Schremp as Cypress/Hannah and Mary Williamson as Redd the Puppet Master. Neverbird Project's adaptation of Pinocchio is co-written and co-directed by Levi Holloway and Katy Boza. The principal cast features Julissa Contreras, who is Deaf, as Pinocchio, with Haley Bolithon as Blu, Sarah Cartwright as Cricket, Chris Chmelik as Geppetto, Skyler Schremp as Cypress/Hannah and Mary Williamson as Redd the Puppet Master. 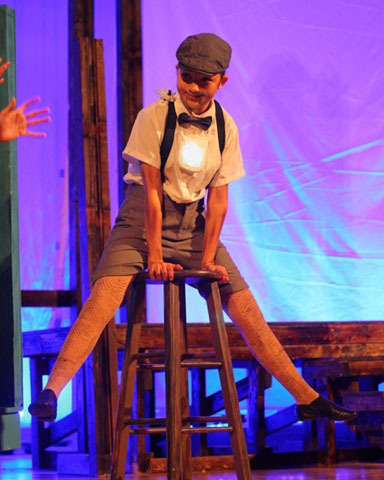 Claudia Tani plays Corktopp, Steven Huetteman is Blowpopp and Elijah Jackson plays Lampwick. The Afters/Redd's Troupe of Vaudevillian Puppets are played by Makeda Duncan, Leah Healy, Paige Healy, Delilah Lane, Sofia Richter Nia Sarfo, Isabelle Teruel and Tali Vittum. NEVERBIRD PROJECT from Levi Holloway on Vimeo. Pinocchio is based on the Italian children's novel "The Adventures of Pinocchio" by Carlo Collodi, which was popularized by Walt Disney's wildly successful 1940 animated musical fantasy film. 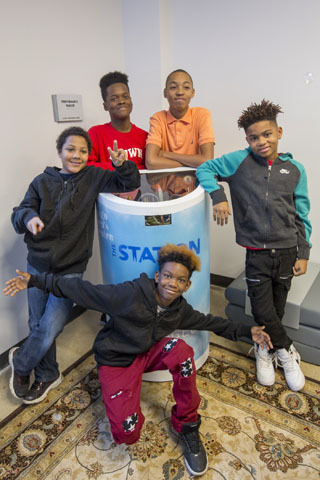 Performances are April 20-May 7 at the new Chicago Children's Theatre, The Station, 100 S. Racine Avenue in Chicago's West Loop. Performance times are Thursday at 10 a.m., Friday at 7 p.m., Saturday at 2 p.m. and 6 p.m. and Sunday at 2 p.m.
Press are invited to review Pinocchio Friday, April 21 at 7 p.m., Saturday, April 22 at 2 p.m. or 6 p.m., or Sunday, April 23 at 2 p.m. Single tickets are $25. Save money with a Family 4-Pack, only $80. Run time is 60 minutes. Pinocchio is intended for ages 7 and up. For tickets and information, visit chicagochildrenstheatre.org or call (872) 222-9555. Email groupsales@chicagochildrenstheatre.org or call (773) 227-0180 x 321 for discounted group rates for schools, playgroups and scouting groups. Saturday, April 29 at 2 p.m.
Saturday April 29 at 6 p.m.
Sensory Friendly for guests on the autism spectrum. Modifications are made to production elements like lighting, sound and music to avoid sensory overload, with a nearby Quiet Room. 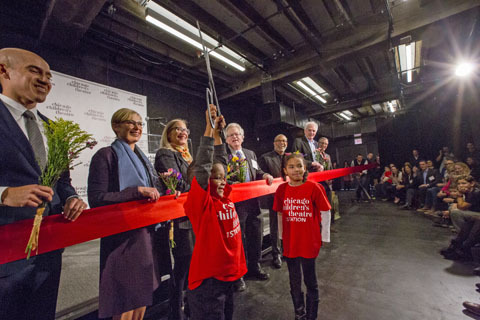 Ribbon cutting and grand opening of the new Chicago Children's Theatre, The Station on January 17, 2017. 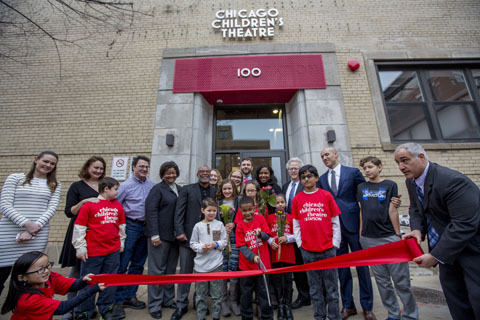 Chicago Children's Theatre has transformed the former 12th District Police Station, located in the heart of Chicago's West Loop neighborhood at 100 S. Racine Avenue, at the intersection of Racine and Monroe Street, into its first permanent home. The new Chicago Children's Theatre, The Station, is a beautiful, mixed-use performing arts and education facility designed to serve all Chicago families. 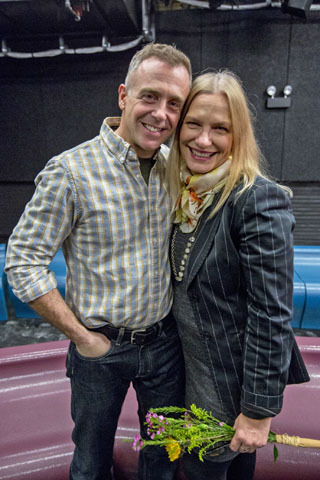 In addition to presenting shows in the 149-seat Pritzker Family Studio Theatre, The Station boasts five brand new classrooms for performing arts instruction. Registration is open for a diverse roster of classes and camps for toddlers to teens in theater, storytelling, modern movement, film making, hip hop, craft, aerial circus arts and vocal instruction. Learn more at chicagochildrenstheatre.com/education. Additionally, CCT now has its own dedicated space at The Station for Red Kite programming for children with autism and other special needs. This spring, children will participate in a new Red Kite Adventure, a multi-sensory theatrical experience tailored to the unique needs of each child who attends. The Station will also be home to Camp Red Kite, the only summer arts camp of its kind in Chicago for children on the autism spectrum. 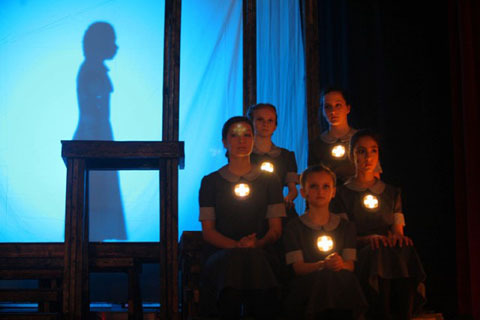 Likewise, CCT has always believed children should be treated as the sophisticated audiences that they are, showcasing high profile and award-winning talent, inventive production values and compelling stories that challenge, educate and entertain. Audiences have embraced Chicago Children's Theatre since its inaugural production, A Year with Frog and Toad, at the Goodman Theatre in 2006. 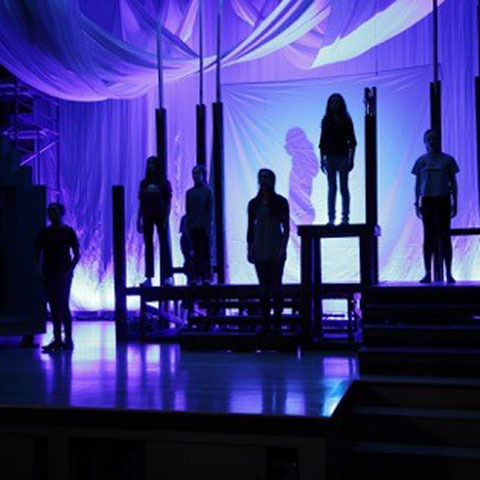 Since then, CCT's productions have featured everything from black-light scenery to live music to interactive four-dimensional sets to life-size puppets, with performances showcasing the heart of Motown to Vaudeville to contemporary, current and modern styles. CCT has also built a national reputation due to its focus on new work, producing 15 world premieres in the last 11 years including The Selfish Giant, The Hundred Dresses, Jackie and Me, Dot and Ziggy, The Houdini Box, The Elephant and The Whale (in association with Redmoon), Mr. Chickee's Funny Money, Leo Lionni's Frederick, Wonderland, Alice's Rock & Roll Adventure, A Snowy Day with Beatrix Potter, Jabari Dreams of Freedom, Another Snowy Day with Beatrix Potter and The Magic City. These enjoyed successful inaugural runs in Chicago, many followed by new productions at theaters across the U.S. Led by Co-Founders, Artistic Director Jacqueline Russell and Board Chair Todd Leland, and Community Programs Artistic Director Frank Maugeri, Chicago Children's Theatre is supported by a dynamic Board of Directors comprised of dedicated individuals from the fields of entertainment, philanthropy and business. Officers include Jeff Hughes, President; Lynn Lockwood Murphy, Vice Chair and Secretary; David Saltiel, Vice Chair; and David Chung, Treasurer. Chicago Children's Theatre is sponsored in part by ComEd and Goldman Sachs Gives. The mission at Neverbird Project is to be a youth based artistic home of Unsettlers, as well as cartographers of the unvoiced and undiscovered territories within ourselves and others. Through the use of American Sign Language, spectacle, and wonderment, Neverbird Project aspires to enrich and broaden the depths of our community by creating vibrant, diverse, question driven art for all. Levi Holloway and Katy Boza are the founders and co-artistic directors. Hilary Williams is managing director. For more information, visit neverbirdproject.org.